The Liaden Universe (R) Saga Continues Star-spanning galactic trader Jethri Gobelyn adventures are the focus in book 17 by master storytellers Sharon Lee and Steve Miller. 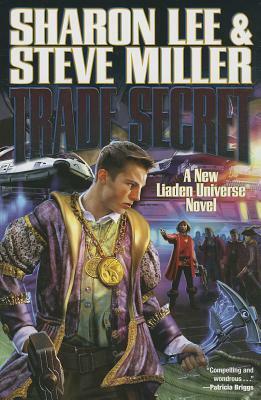 Star-spanning galactic trader Jethri Gobelyn's story continues in the seventeenth entry in the Liaden Universe(R) series by master storytellers Sharon Lee and Steve Miller. In a universe full of interstellar intrigue and burgeoning commerce novice Terran trader Jethri Gobelyn, adopted by a Liaden clan after an ill-directed bow of honor insulted the scion of a major Liaden house, is alive and whole to tell the tale. Convinced that the adoption has saved his life and made his future he settles into a comfortable and even elite routine, a Trader's Ring his goal. Even as Jethri's initiation into the mysteries and joys of Liaden Festival bring him to manhood he's forced to face Necessity and the facts of life: his adoption has also invigorated a net of unfinished Balance far more complex and potentially deadly than a simple Terran blood feud. He must embrace his Terran birthright as well as his Liaden connections while leaving behind the safety of the great Liaden trade ship Elthoria to defend his honor and that of shipmates past and present. Forced to sit Second Board as a back-up pilot on a Liaden Scout ship, Jethri's convinced he's already at wit's end--when several familiar faces threaten all that he knows of himself, and all that he wishes to do.